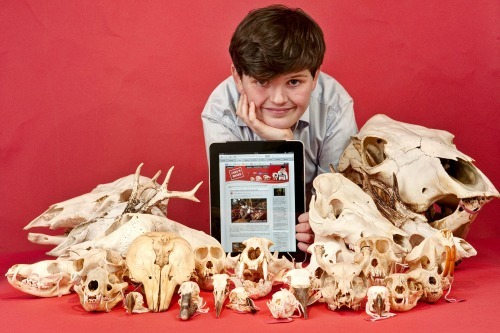 One of the UK’s top child bloggers, 11-year-old Jake of Jake’s Bones has landed a book deal . Jake’s been writing his blog about his hobby of bone collecting since he was seven and has thousands of fans all around the world. His new book, also called Jake’s Bones will feature a cartoon version of Jake and is designed to introduce young children to bone collecting. TickTock Publishing approached Jake, who lives in Scotland, because they thought his blog would make a perfect book. Jake tells what happened next over on his blog. The Jake’s Bones book won’t be published until Spring 2014 – publishing a book takes a lot longer than publishing a blog post. We can’t wait! Here at KBC we would like to say an enormous CONGRATULATIONS to Jake for this fantastic achievement. It just goes to show that writing a blog can take you into all sorts of amazing adventures and opportunities. We’re sure he won’t be the last kid blogger to write a book. Could the next one be you? I am very inspired by you colecting bones as your hobby and that you are going to write a book. This inspires me because it means that children and not just adults can be famous and write a book about themselves. I hope you go very far in this hobby and come out in flying colours.May God bless you. Goodbye. Thats relly cool. so what have you found? It is so inspiring that you collected many fossils. You really made a different in all kids. You basically told everyone to do something that they can be inspired by. That’s why I would love to become a singer,and I’m only a 11 yrs old. My name is Favour and I like to laugh in SCHOOL. Everything is good at school ! !